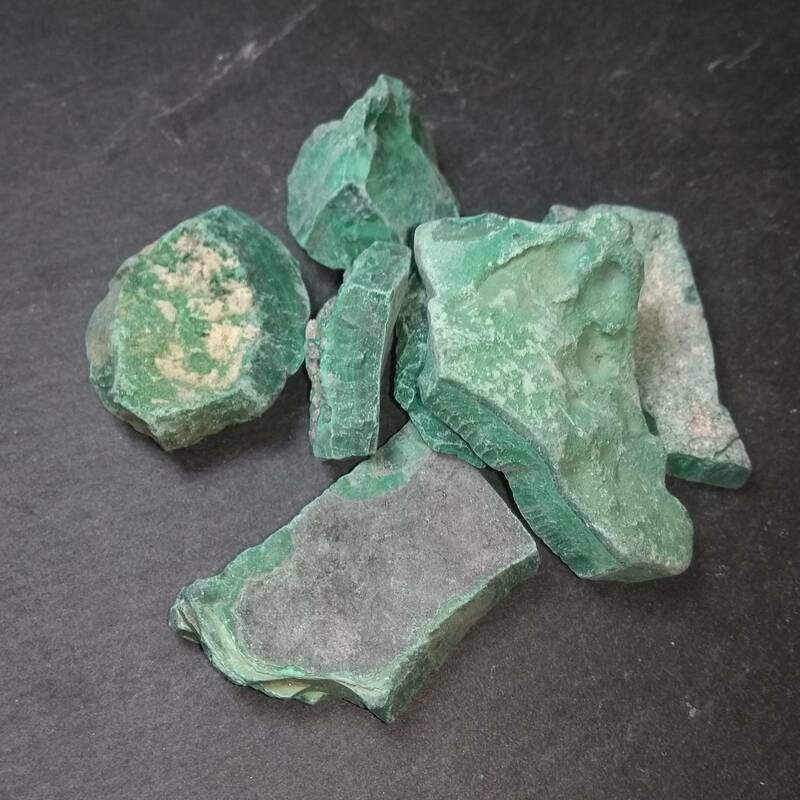 Malachite is a gorgeous green copper based mineral which is typically used as a gemstone or decorative object – it is sometimes sold tumbled, carved, or cut into cabochons. Malachite is a lovely banded green Copper ore, which is typically sold polished or carved to really show off the gorgeous colours. It has been mined since antiquity. In Britain the mines at Great Orme were mined around 3800 years ago for Copper production. It is named after the ancient Greek word for “mallow”, which was a green herb. Malachite was also used as a mineral pigment in green dyes until as late as the 1800s, after which it was replaced with synthetic forms. As a decorative stone, it has been used in some truly grandiose designs, including rooms at the Hermitage and the Castillo de Chalpultepec. Typically speaking, Malachite is either used as a Copper ore, polished, or sold as a mineral specimen nowadays. Polished pieces include tumblestones, carvings, cabochons and jewellery. Copper Carbonate Hydroxide, with the formula Cu2CO3(OH)2. It often occurs in botryoidal, stalagmitic, and fibrous formations, or as crusts on other rocks. It measures between 4 and 5 on the Mohs scale, and has a specific gravity of between 3.6 – 4.0. If you’re looking to test this mineral, use white streak plates – the streak is typically green. Malachite is found worldwide, with mines (both historical and active) in the UK, Australia, Austria, Germany, Canada, Russia, the USA, and various countries in Africa. Some of the most beautiful pieces I’ve seen are found in the Democratic Republic of the Congo. If you are looking up the hazards of Malachite online, make sure not to confuse it with “Malachite Green”. This is a chemical used as a dye and an anti microbial agent, which can be quite toxic. Malachite is relatively safe to handle, despite being toxic to humans and some animals. The real danger comes from crushing, cutting, or otherwise working with the stone. Specimen pieces being handled occasionally present no danger to health, but lapidarists and miners should use a particulate mask or a respirator when cutting or grinding. 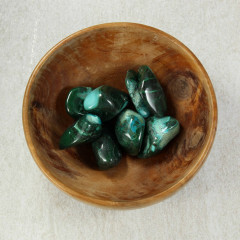 People believe that Malachite is a stone of transformation, helping you to adapt and deal with change. Given that it is associated with the heart chakra, it is also thought to help balance love, romance, and emotional well being. Malachite should never be used in direct contact with liquids, as it is slightly soluble and may leach Copper into the liquid. 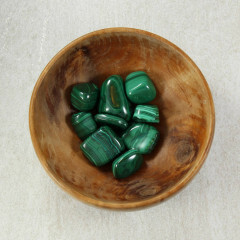 People believe Malachite is perfect for the throat and heart chakras, as it has a deep connection to the Earth. It can also be used to cleanse and activate all the chakras. 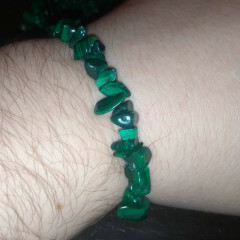 Malachite seems to be associated with several Zodiac signs, including Taurus, Libra, Scorpio, and Capricorn. 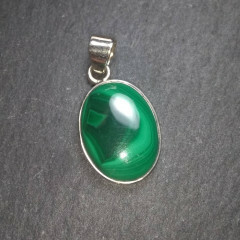 Malachite would ideally be combined with other Copper ores, which it is often found with naturally. Think Azurite, Chrysocolla, etc. Pure Copper is an option too!